In the previous two parts of this series, I transcribed a manorial court record of a property transaction, and extracted information from it. So far, I have only been concerned with information contained within the court session and cases. The next steps are to check names, dates, places and legal language; and to identify people, locations and interpret events. This process draws on information from other sources. I’ll start with checking place names and locate them on a map. The court records contained 11 names of places that referred to 7 specific locations, but stated the type of feature or jurisdiction (e.g. county, parish, dwelling house) in 5 instances. A gazetteer (a geographic index, dictionary or encyclopaedia) is an ideal reference for validating place names. A Vision of Britain is a key resource that includes historical gazetteers, boundary maps of many (but not all) jurisdictions, and tracks the history of jurisdictions. It draws on two gazetteers, John Bartholomew’s Gazetteer of the British Isles (1887) and John Marius Wilson’s Imperial Gazetteer of England and Wales (1870-72). The gazetteers include entries for 8 of the 11 place names, and the boundary maps include the parishes, district, and county. In only one case, the Kings Arms, the place name refers to a specific point, a building. Hamlets and townships were small settlements, and villages and towns were larger settlements, all with no defined boundary. Jurisdictions such as parish, manor, borough, district and county were defined, and with the exception of manors are mapped by A Vision of Britain. Examples are the boundary maps for the county of Salop, also known as Shropshire and the parish of Claverley. Where the court document specifies a jurisdiction, we can be sure of the geographic area covered. I did not find Draycott in the historical gazetteers. The Vision of Britain boundary maps allows viewing of 4 map layers from different times. Draycott is marked on the modern map layers (OpenStreetMap and Great Britain 20th Century) between Aston and Heathton. The same hamlet is named Draycote on the Great Britain 19th Century layer. The court document referred to the manor of Claverley and Claverley as an unspecified entity. The manor and parish were separate jurisdictions and usually did not cover the same geographical area. There could be several manors within a parish and a manor could span the boundary of adjoining parishes. Unlike parishes, manors have never been systematically mapped. In the case of Claverley, I know of 3 documents that describe the manorial boundaries. The earliest, dated 1509, is a metes and bounds survey written in Latin, which awaits transcription and translation (Shropshire Archives ref 5586/13/1). The Manorial Documents Register includes two later boundary descriptions that I have not seen, dated 1615 and 1700-1900 (both at Shropshire Archives refs 1190/1/434 and 1190/1/433). The court document references to the unspecified Claverley could be either the village or the parish. Although the village doesn’t have clear boundaries, I think it does all lie within the parish from my interpretation of the maps. Is there anyone who did not think ‘pub’ when you saw this name? If not, I would guess you are not very familiar with Britain. However, the court document explicitly refers to the venue as a dwelling house, a private residence, not a public house, a drinking establishment. There is a pub called the Kings Arms in Claverley, but is this the same building? A virtual wander in Google maps shows an historic looking building almost opposite the church. The satellite view shows the pub is a large establishment comprised of several buildings joined together. First we need to establish that the current building really is old enough to have been standing in 1844. Fortunately, the Kings Arms is included in the English Heritage’s National Heritage List. The listing describes the part a the building complex that includes the main entrance, and dates it to the 18th century. So, yes it is old enough. The Kings Arms name could have been applied to a different building in the past. The tithe apportionments for Claverley, dated 1839, lists land owners and occupiers who were liable to pay tithes (a church tax) associated with property (Shropshire Archives ref 5586/5/19/1-3). Land parcel number 158 described as ‘Kings Arms Inn, Buildings & Yards’, was owned by William Smith and occupied by John Crowther senior. I haven’t yet examined the tithe map to see where no. 158 is exactly. I would not be at all surprised to find it is the location of the current pub. When I have checked fourth source, the tithe map, as well as Google maps, listed buildings and tithe apportionments, I will be as sure as possible of the location of the Kings Arms, the building where the court baron was held. That is not the same thing as my first thought of ‘pub’. The area of these three land parcels adds up to 3 acres, 1 rod and 16 perches (40 perches to the rod, 4 rods to the acre). The area, description, owners and occupiers all match the property described in the court record, so I am sure land parcels 566, 588 and 589 on the tithe map will show me exactly where the property was. Umm, my excuse for not consulting the tithe map on my last visit to Shropshire Archives is looking feeble. I could swear archive time is accelerated, honest! In the meantime, I’ll pull together what I can. Mill Hill was in Heathton township, which is somewhere near Heathton House, a listed building. The manor of Claverley extended to parts of Heathton township. The tithe apportionments confirm John Wilson’s ownership and occupation of Aston Hall, but possibly not the current building which dates from mid-late 19th century. I have marked the places as points on the map below, but this fails to convey that most place names refer to a larger, undefined area (e.g. township) or a jurisdiction. It is useful to see the spatial relationships between places. The approximate directions and distances of places found in the gazetteers are confirmed on the map. Did you think looking at a modern map was all you needed to confirm where your ancestors lived and did things like attending a court? Next time I will examine the people involved in the court proceedings. This extract makes several claims: the marriage, the residence location, Ann’s burial, and the couple’s children. Can these claims be confirmed? I give to my four children, viz, Mary, Ann, Thomas and Joseph the sum of one hundred pounds to be paid within one year next after my decease. Given the marriage in 1778, these 8 baptisms commence the year after and are spaced at about 2 yearly intervals. The timing pattern of baptisms reflecting births is what I would expect to see for George and Ann. The three children named in the family history are also in the correct birth order. Further research to show that the other 5 children did not survive to adulthood would add credence to the inherited family history. The location of George Boraston’s residence, Hodge Hill, near Kidderminster can be found on a modern map, on the eastern outskirts of the town. Place names may persist over long periods of time, but we should check that Hodge Hill is associated with this location at earlier times. An interactive version of the 1842 tithe map is available at the Worcestershire Tithe Mapping website. The land parcel at this location, recorded as ‘Hedge Hill Farm’, refers to a farmstead owned by the Earl of Derby’s estate and occupied by a tenant, George Wilson. The farmstead is named as Hodge Hill Farm on earlier estate map created for a sale in 1833. If the tenant George Wilson is a relative of George and Ann, it would support the claim of their residence at Hodge Hill. Property records may also contain further evidence. “England Marriages, 1538–1973”, database, FamilySearch (https://familysearch.org/pal:/MM9.1.1/NKS8-2YL : accessed 28 Jun 2013), George Boraston and Anne Wilson, 02 Jul 1778. citing Family History Library film no. 435263. citing Church of England. St. Mary’s Church (Kidderminster, Worcestershire), Marriages, 1767-1789. Will of Matthew Wilson of Kidderminster, Worcester, made 2 Feb 1776, proved 16 July 1776. Worcestershire County Records Office. Will of William Wilson the Elder of Walton, Clent, Worcestershire, made 15 May 1788, proved 7 Feb 1789. Worcestershire County Records Office. Will of Sarah Wilson of Wannerton, made 19 January 1795, proved 2 February 1795. Worcestershire County Records Office. Sale plan of Park Hall mansion & estate (in Churchill & Blakedown) 1833. Worcestershire County Records Office, 705:554 BA4813. 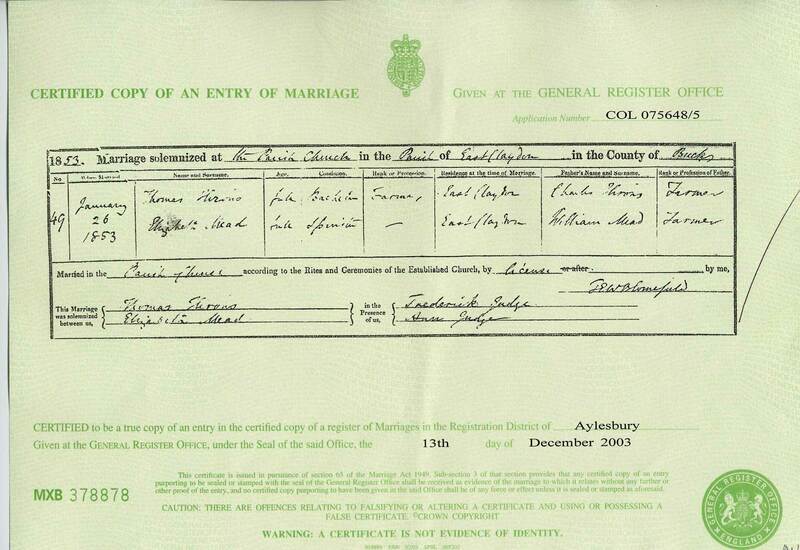 Every newly discovered document points to further research, as does this week’s 50 Marriage Mondays entry. The trick to successful research is to have a plan so that I avoid The pinball approach to genealogical research. Thomas and Charles Hirons were both farmers, so I want to know more about their farming careers. How might I go about investigating? First, I’ll focus by asking some questions; second, identify types of sources that are likely to provide insights; third, locate said sources. Then armed with a research plan I will access the records, analyse new information and formulate new questions. Can I corroborate that the Hirons really were farmers? Did father and son farm the same land? Exactly where was the farmland, which fields within the parish? Did they raise crops or livestock, or a mixture? Did they own land or were they tenants? Was farming a profitable living? I could ask many more questions, but I want to stay focused. Census records include occupational information, so should confirm the Hirons’ occupation and might name the farm. As the censuses are readily available online and provide supplementary information, so I will check them before exploring other sources. Tithe apportionments list land plots with owners, occupiers, land use and area for the calculation of tithe payments, a tax raised on the value of produce collected for the support of the clergy. The land plots are marked on the accompanying tithe maps. Tithe apportionments were mostly undertaken between the 1836 and the 1850s, in compliance with the Tithe Commutation Act. If the Hirons were recorded on them, the tithe apportionments and maps could substantially answer my more detailed questions. Three copies of tithe records were created, one each for the tithe commissioners, the diocese and the parish. The National Archives collection of tithe commissioner’s copies, which can be ordered online for a fee or examined for free at Kew, are the most conveniently accessible. Trade directories and county histories from the nineteenth century provide descriptions of the parish and list prominent community members and local businesses. This background context will give me a feel for the agricultural community in which the Hirons family lived. Probate records such as wills and administrations indicate the value of the estate and may indicate if the deceased owned property. Of course there are other sources, but in the interests of staying focused, I have limited the search for now. My original questions assumed that only one farm was occupied by the family, but this is not the case. ‘Out of business’ tempts me to search for bankruptcy records. I made a plan to avoid being sidetracked, so for now, I will only investigate the farm at East Claydon. A simple search using the terms ‘East Claydon tithe’ of the new National Archives catalogue, Discovery brings up East Claydon’s tithe apportionment and map entries. The apportionment is dated 5 November 1857, so falls in 1857-1858 period when the census records suggest the family moved from East Claydon to Westbury, so could narrow down the date of the move. The apportionment description comments, “Apportionment is in condensed summary form, with little detail”, so it sounds like the agricultural detail I had hoped for is lacking. The tithe map description is similarly discouraging, “Scale: 1 inch to 8 chains. Only a few large enclosures shown”, so does not identify fields as I hoped. The East Claydon entry in the Victoria County History for Buckinghamshire, available at British History Online, tells me that dairy farming was the main agricultural activity, mixed with arable crops of wheat , beans, roots and oats. The description dates from the early twentieth century, so may not reflect the Hirons’ activities some 40 years earlier. A couple of directories at Historical Directories include relevant entries for East Claydon. The 1854 Post Office Directory lists Thomas Hirons as a farmer and the 1864 directory lists a Charles Hirons as a farmer at Monkomb Farm. As Charles was aged 79 in 1851, this may not be the father of Thomas, but may well be a relative. Monkomb Farm seems suspiciously similar to Moncklon. 17 April. Administration of the Personal Estate of Charles Hirons late of East Claydon in the County of Buckingham Farmer who died 23 February 1879 at East Claydon was granted at the Principal Registry to Catharine Ann Hirons of East Claydon Widow the Relict. Could this be the Charles listed in the 1864 directory? I can order copy of this administration by post using the above information to complete the application form PA1S for a £6 fee. The 1853 entry is a good candidate for Charles the father of Thomas. As Thomas’ birthplace reported on the censuses is Chetwood or Chetwode, I wonder if the earlier wills are relevant to this family. The website includes online ordering, so I am tempted to save on postage by ordering them all.